AQTime Pro can be used as a standalone profiler, as well as integrated into Microsoft Visual Studio and Embarcadero RAD Studio for improved developer productivity. Native Windows applications (Visual C++). .NET applications (C#, Visual Basic .NET, managed Visual C++ and so on). Mixed applications (containing both .NET and native code). Standalone Windows applications, individual DLLs, Windows services, IIS, ASP.NET, XBAP, Silverlight, COM, COM+ and DCOM applications. AQTime Pro lets you compare results of two or more profiling sessions to evaluate the performance of different implementations and the effects of code optimizations. All profiling settings and results are stored in your Visual Studio solution for easy access at a later date. AQTime Pro profiles your application down to the line level, pinpointing the exact code where most time is spent or leaked memory allocated. Detailed profiling data makes it easy to see issues at a glance and identify optimization candidates. AQTime Pro integrates with Embarcadero RAD Studio XE6, XE7, XE8, and 10. With AQTime Pro, profiling in the IDE is as easy as running your application. All profiling features are available at hand via the IDE menus and toolbars, so you can get started quickly. AQTime Pro helps you pinpoint the exact functions and lines of code that cause performance issues and memory leaks in your applications. 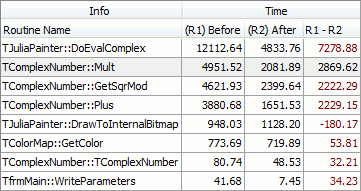 Quickly navigate from the profiling reports to the corresponding code in the RAD Studio editor. With timings, hit counts and other profiling metrics displayed next to the code lines in the editor, you can easily see what exactly needs optimization. Profiling settings and results are stored in your RAD Studio project group for quick access and later reuse. 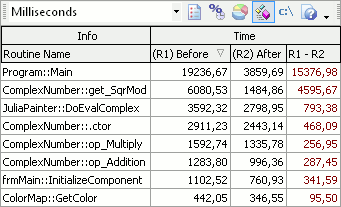 You can compare previous profiling data with the latest results to understand the performance effects of recent code changes.